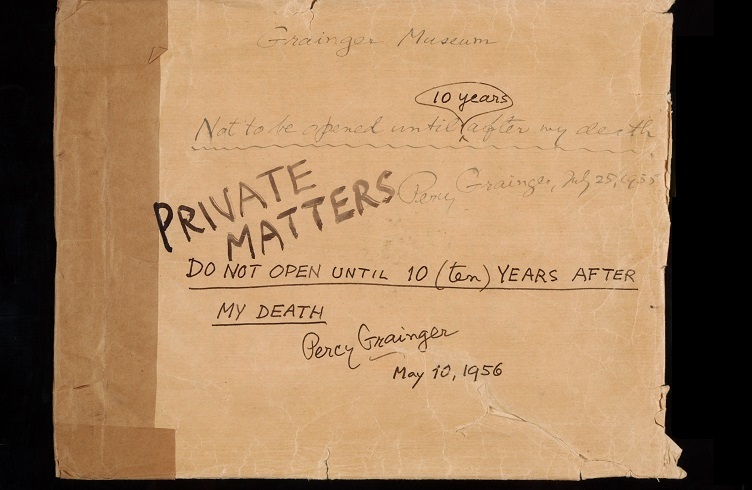 Private Matters: Percy Grainger's writings about his personal affairs remained sealed until 1972. Postgraduate students in the subject POPH90270 Bioethics and Public Health used the Grainger Museum in a seminar that stimulated ethical thinking through explorations of the life story of Percy Grainger, as presented by objects and images in the Museum. Museum experiences like those the Bioethics students experienced is an effective pedagogical approach that stimulates students’ moral imagination, increases their awareness of their own emotional reactions to ethical issues and enhances their capacity to recognise moral dimensions of clinical experiences.Pedagogical encounters with cultural artefacts, in the context of “Object-based learning” have been shown to powerfully engage learners, because the objects themselves “carry stories” of real people and make the abstract past tangible and current. Rebecca Garden, in the Health Humanities Reader, writes that narratives explored through material culture are an invaluable means to promote a more critical and nuanced understanding of social contexts of health, ‘particularly the power relations and social norms in the clinic that contribute to disparities and discrimination, as well as the social factors that contribute to disease and disability’.